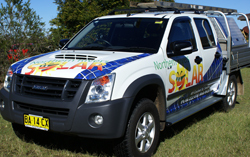 Vehicle graphics are arguably one of the most effective forms of branding and advertising available for most businesses. Your vehicles become mobile billboards, re-enforcing your brand awareness and alerting new customers of your existence. It entails a one-off investment, after which your message is delivered to your audience for free every time the vehicle is on the road. Modern materials and improved application techniques mean you can enjoy a fantastic return on your investment. Long term vehicle graphics correctly applied will look fantastic for the life of most lease agreements. 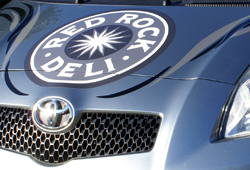 Another recent trend is to use short term graphics on vehicles. This can now be done economically thanks to the development of new media and is useful for new product launches, events promotions and the like. If quality materials are used, both long and short term graphics can be removed at the end of the vehicle’s service life with no damage to the vehicle. In fact, in the case of a full wrap, the vehicle’s paint has effectively had a protective skin and will be in better condition after the wrap is removed than it would be if exposed to the elements. 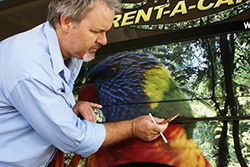 There are two quite different techniques used in the production of vehicle graphics. They are computer cut decals and digitally printed decals. They can be used separately or in tandem to produce the desired result. Computer cut decals are manufactured using solid colour vinyls. The designs are created on computer design software and cut out using a cutter/plotter. The unwanted parts of the design are removed (or weeded out) and the remaining graphics have a sheet of application tape applied over them making a pre-spaced sticker. This can be considered the earliest form of computer signage and is still used extensively today to create fantastic single and multiple colour designs. A huge range of solid colours are available as well as specialty lines like chrome, gold, holographic, metallic effects, fluro colours and reflective vinyls. A well designed vehicle wrap is not only a thing of great beauty, it is a powerful branding message that is difficult to ignore. Digitally printed wraps, used in conjunction with window graphics allow you to get really creative with your thinking. Virtually any design you can imagine is possible. Full photographic images or complicated multi-coloured designs are all possible. 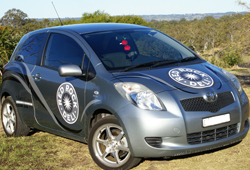 We're proud to be the winner of Round 2, 2009 3M 'It's Our Shout' vehicle wrap competition. Also very effective as a marketing display is a partial wrap. Typically you might wrap the back or front end, or the lower half. Combined with some computer cut vinyl lettering you can also send a clearly stated message to your target audience. For those who want to take advantage of the premium marketing space that a vehicle's windows offer, we can help with One Way Vision window film. It is a printable, perforated mesh vinyl material that allows the inside viewer to see through to the outside, but restricts the visibility of others looking in. It can be applied to the rear windows of cars, trucks, vans and buses. With One Way Vision film it is important to remember that it should be laminated with an optically clear sheet, otherwise the perforations will fill up with dust and dirt. If installed unlaminated on a rear window with a wiper, it may inhibit the correct function of the wiper.